For destination-intensive itineraries, excellent food, a comfortable onboard experience that lets you leave your tux and gown at home and service with a genuine smile, you can't go wrong booking a cruise on Azamara Journey. A cruise on Azamara Journey feels a little like coming home, whether you've cruised on the ship before or not (and dozens of repeat cruisers are on nearly every sailing). With fewer than 700 passengers onboard and only five decks with public spaces, it only takes a day or two before the ship feels familiar; you've found your favorite spot to sit in the Living Room, you know where to find free cookies at any time of day and you start recognizing faces (crew and fellow cruisers alike). The ship's size lends itself to an amiable onboard atmosphere as well. The bulk of the tables in both Discoveries Restaurant and the buffet are designed for two people but pushed close enough together that mealtime conversations across tables are a common occurrence. Trivia sessions, which are held three times most days, encourage team building; strangers quickly bond over themes such as nature, the body, sports and music. Service is also friendly, as well as efficient, especially in the restaurants. If you find wait staff you like and return to them on a regular basis, they'll get to know your favorite drink order, how you like your coffee and, if you're like certain reviewers, which gelato flavor you need to cap off every day. Unlike dining and bar service, cabin service can be hit or miss, with several cruisers reporting their room stewards never introduced themselves, nor pointed out some of the unique quirks of the rooms (like the USB chargers hidden underneath the reading lights). It also took us three days to get extra hangers despite asking several times. But ice buckets were always filled, towels rehung in the bathroom and the cabin kept clean overall. 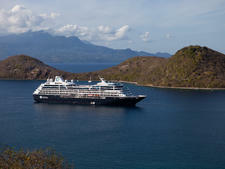 Another hallmark of the Azamara Journey experience is its destination focus. One of just two ships in the Azamara Club Cruises fleet, Journey stops in a mix of standard and off-the-beaten path ports, offering longer stays and at least one overnight on each sailing. On a Greece itinerary, for example, the ship not only stopped at the island standards of Mykonos and Santorini, but also visited Skiathos and Hydra, while on a Central America sailing, the ship not only stopped at Puerto Vallarta and Cabo San Lucas, but also at Acajutla, El Salvador and Huatulco, Mexico. The culmination of Azamara's destination focus is the complimentary AzAmazing Evening that's held at least once per voyage. These events are billed as one-of-a-kind and might feature events like a classical music concert among the ruins of Ephesus, a recital by three tenors on a hillside in Tuscany or a ceremonial performance by indigenous people native to Mexico in the foothills of the Sierra Madres. Another special evening that's held every cruise regardless of destination, the White Night Party, is also unabashedly popular, judging by passenger participation. Because the ship has no set homeport, the passenger makeup changes on every cruise. Expect to see an equal number of Americans and Brits when Journey is in Europe or the Americas, with Australians becoming predominant when the ship moves to Asia. The average passenger age also varies, depending on the sailing. Shorter cruises of less than two weeks tend to draw mostly older professionals, ages 48 to 65. Longer sailings have more retirees. You'll find lots of couples or friends traveling together; family groups are primarily limited to parents sailing with their adult children. There are few kids younger than age 10. Cruise Critic’s professional photographers and our extraordinary community members have taken 1,261 pictures of Azamara Journey. When you visit our photo galleries, you can be assured that what you see is what you get. 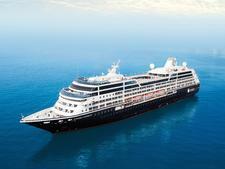 Azamara calls its dress code "resort casual"; there are no formal nights. The line does ask passengers to refrain from wearing blue jeans in the main dining room and specialty restaurants after 6 p.m., and tank tops, ball caps, bathing suits and shorts are also not permitted. In general, most women wear sundresses and capri pants during the day, changing to nicer maxi-dresses or pants in the evening. While you'll see men wearing T-shirts during the day, collared shirts are the rule at night. Tips are included in your fare, a factor that makes the line particularly popular with passengers from non-tipping cultures like Europe and Australia. An 18 percent service charge is levied on spa treatments; no additional gratuity is added to the cost of any extra-fee beverages. The U.S. dollar is the onboard currency. Other onboard items included in the overall fare are nonalcoholic drinks, select standard spirits and beers, house wines (a selection of one red and one white that changes daily) by the glass, DIY laundry and one AzAmazing evening excursion per cruise.